Details: Business Intelligence, Data warehousing and ETL Process information with vast business and technical knowledge about the most interesting solutions on the market. It is a good place to learn about data warehouse architecture, business intelligence concepts, the most common datawarehousing problems, ETL process, data integration, data quality management and other BI-related topics. 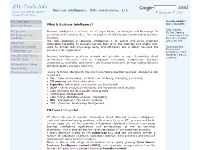 The ETLTools Info Business Intelligence and Datawarehousing information portal illustrates how to implement DW solutions with technologies like Datastage, Cognos, SAS, Open Source Business Intelligence (OSBI) Pentaho products and other commercial and opensource BI tools.